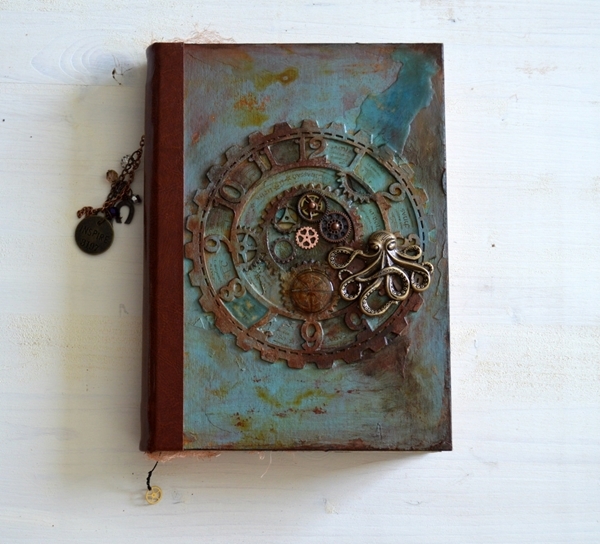 The covers have many layers of paint, pastes, mediums and elements, to achieve a "weathered" steampunk look. Although the surface looks rusted, rough and well-used, it is treated with wax and special mediums, and has a surprising soft and velvet touch. At the front cover, there is a big clock decorated with metal gears and a metal octopus. It contains 122 pages (counting both sides)- some printed , and the rest hand stamped, painted , distressed and decorated by me. All pages are of high quality recycled paper of 240 gsm, in a very beautiful creamy tone, that makes it look old. It is also acid free, chlorine free and suitable for photos. All the distressing has been done with special inks and not coffee or tea, to ensure that the paper will keep its neutral PH, be photo safe and last for meny years! It is bound using strong 3-ply Crawford's Irish linen thread in Black and has a matching page marker with a gear. The spine is made using a very soft brown man made leather and is decorated with a cluster of charms on a metal chain. There is an also a hook left empty for you to further personalize the book. Its size is 17,5 x 25cm ( 7 x 10 inches). The young man sat at the desk with a sight. This time he knew that he was close. He was very close to decipher the scripts and begin his journey. "Damn the mechanic! ", he thought as he opened the old journal with the faded pages. The drawings were incomplete, the instructions were indecipherable... the most vital parts were coded! And still! If he wanted to make sure that the journal would not be read, he would never have left it on the desk before beginning the time travel. "The man left a note, for heavens sake! He wanted us to try! ", he said aloud. He looked at the yellow cringled paper. The scribbles read : "Beware traveller: Ocean is more ancient than the mountains, and freighted with the memories and the dreams of Time. And circulating light could twist space!"